Boho Beach Bungalow: Lions and Tigers and...Boots? Oh MY! Lions and Tigers and...Boots? Oh MY! So I have to say, boots happen to be really versatile. I mean, dress them up with a skirt, dress them down with a ripped pair of jeans. 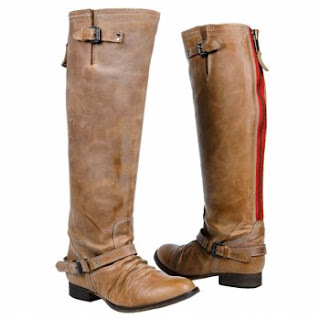 Nowadays, they're coming in all different styles: ankle, mid-calf, slouchy, thigh-high, well worn, suede, leather, etc. The latest trend in LA at least, have been these amazing pair of distressed leather Steve Madden boots with a fun zipper back that gives them a little extra pop of color. Lately I've been diversifying my wardrobe by adding pieces that are a little more edgy, and these certainly fit the bill. They have a toned-down motorcycle type of feel, and not too much distressing so as to make you look like a homeless person. My favorite aspect is the wide variety of colors--they have a beautiful green leather, which to be quite honest is the direction I would go in--and they would look great with my black leather jacket! Now while I like to set the trends rather then follow them, these boots occupy a soft spot in my heart; if I could, I would own every color.